A favourite with many visitors to the Islands, the Galapagos penguin is the most northerly occurring species of penguin in the world. 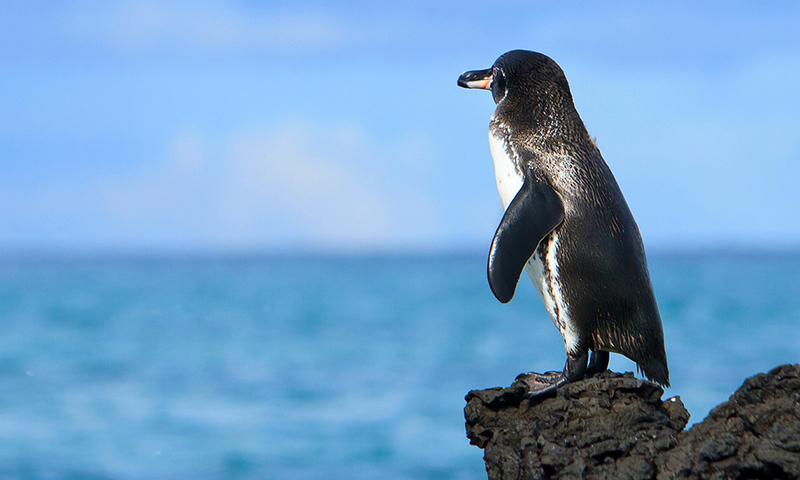 The Galapagos penguin is one of the smallest penguins in the world and is endemic to the Galapagos Islands. It is the most northerly occurring penguin species, nesting entirely in the tropics, with some colonies living on the northern tip of Isabela in the Northern Hemisphere. They are closely related to the African, Humboldt and Magellanic penguins – all of which are burrow-dwelling. As there is no soft peat in which to burrow on the Galapagos Islands, Galapagos penguins instead live in caves and crevices in the coastal lava. 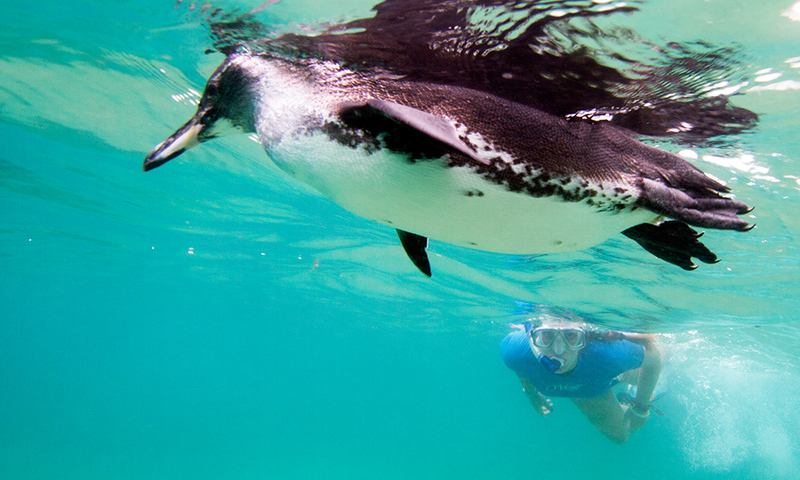 As with all penguin species, they are extremely agile under water, reaching speeds of 35 km per hour when hunting. Their diet consists primarily of cold-water schooling fish, such as anchovies, sardines and mullet, which are able to live in the Galapagos Marine Reserve thanks to the cold waters of the Humboldt Current. 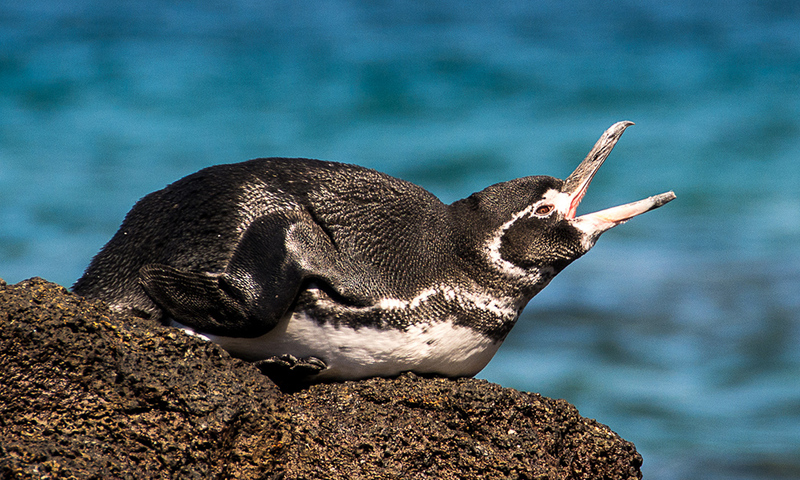 Galapagos penguins mate for life, with the female laying between one and two eggs which are incubated for 35-40 days. The dark-brown chicks fledge at the age of eight to nine weeks old. Penguin breeding success is very closely linked to environmental conditions; therefore climate change is a major threat to their future. In 1982, there was a particularly strong El Niño event that caused 77% of the population to die of starvation and the population has been recovering ever since. The current population is estimated to be just 2,000 birds. Where to see them: They are found mainly on Isabela and Fernandina islands but they can also be seen on Floreana, Santiago and Bartolome. People often swim with them around Pinnacle Rock on Bartolome. 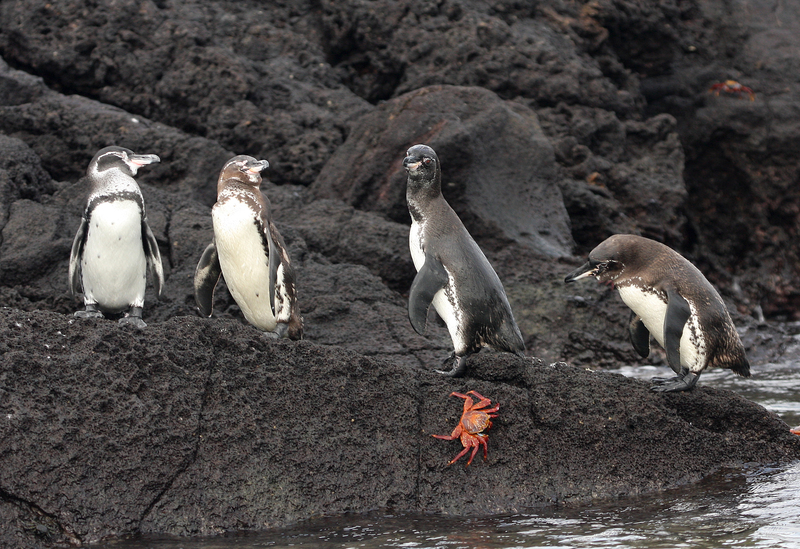 When to see them: Galapagos penguins live and breed on the Galapagos Islands all year round. Threats: On land, snakes, owls and hawks are potential predators but predation by them is generally minimal. Introduced cats and rats frequently attack both adults and eggs. 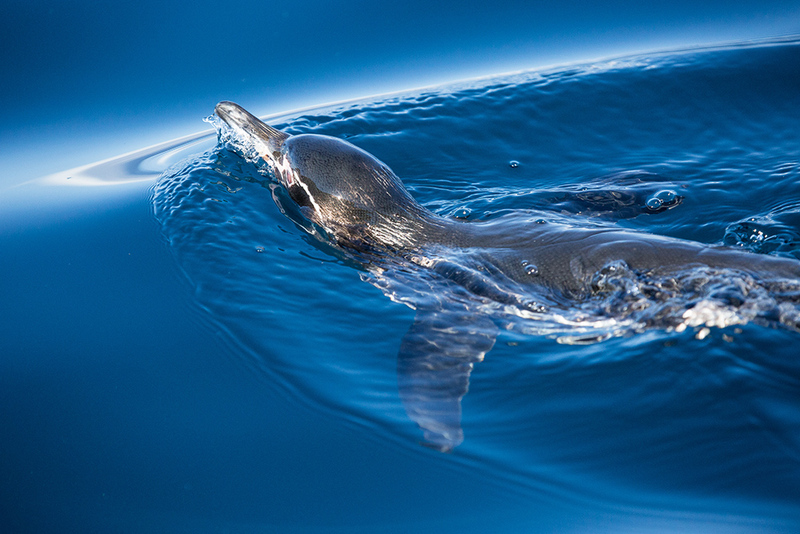 In the sea, penguins may be hunted by sharks, fur seals or sea lions, and they are sometimes caught as by-catch in fishing nets. El Niño events dramatically influence reproductive rates, often causing a large proportion of the population to die of starvation. They are also potentially at risk from marine plastic pollution. Conservation Actions: Between 2010 and 2016, GCT funded a project to monitor populations of Galapagos penguins, flightless cormorants and waved albatrosses in the Islands. Currently, we are working with partners to assess the risk of marine plastic pollution to Galapagos penguins as part of our Plastic Pollution Free Galapagos programme. Help us to protect Galapagos penguins today by donating to our Plastic Pollution Free Galapagos programme! 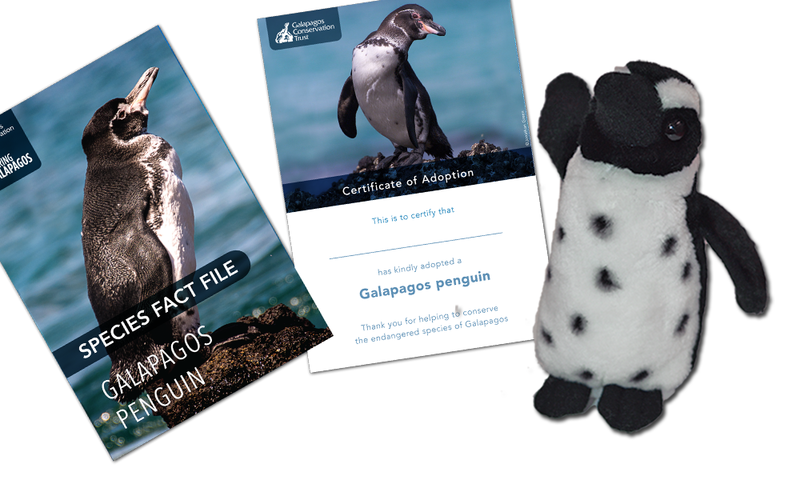 Sponsor your very own Galapagos penguin today! By purchasing one of our Galapagos penguin adoption packs you will be directly contributing to the conservation of this endangered species.